I work at a gym. It’s the first week in January. Needless to say, things are hectic. I get it. People want to turn over a new leaf and what better way to do that than with a new year? It’s so hard during the holiday season. Six weeks of parties, fantastic once-a-year meals, rich drinks, time spent relaxing. If you’re trying to be healthy, the holidays are almost like the enemy. Well, they’re over, and it’s time to get back on track. Time to hop on the saddle and get to business. I know I’ve reviewed a couple of products within the past few months and I have a few more up my sleeve. In fact, I’ve saved my favorites for last. Earnest Eats. Love. Blueberry Vanilla Almond tastes like a blueberry muffin. Um, I'll take it! You might have seen these in your local grocery store or coffee shop. Well, snag one. Let me tell you why. First of all, they are really nutritious. They use whole food ingredients. I’m trying to cut down on my artificial sweeteners and so I’m very okay with this. Choco Peanut Butter toasted was so rich and filling as a nutritious dessert. Second of all, they are a great mixture of snack foods all smashed into one little bar (or big bar). They come in two sizes: planks and bars. The bars are little squares and the planks are two servings and definitely a much bigger snack. In either choice, You can see the individual pieces of fruit, nut, oat and seed. I mean look at them. How awesome is this bar?! They use almond butter instead of oils which I think makes a big flavor enhancer. Third of all, the flavor combinations are amazing. My absolute favorite was maple crunch but a close second was blueberry vanilla. Cran Lemon Zest was a great addition to my oatmeal. It was refreshing. Other flavor combinations are apple ginger, cran lemon zest, choco peanut butter and pomegranate walnut crisp. Whatever type of flavor you are into, you will find it. These bars are satisfying plain but absolutely outstanding heated up in the toaster. Alongside some milk—heaven, I swear. Ohh my favorite. Maple Almond Crunch was such a warm comfy taste. Try this one first! Lastly, the thing about Earnest Eats that is cool is their philosophy in using responsibly farmed sustainable ingredients. They believe in small batch baking instead of mega-mixed mass-production. Formerly known as Honest Eats, this company is five star. You can order them online or at many of your local grocers. 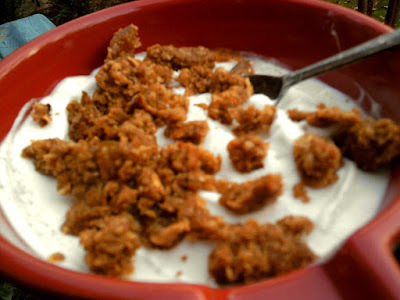 Apple Ginger toasted and crumbled made this bowl of yogurt have a little pizzaz. I’d recommend these bars to just about anyone. They are tastier than a lot of nutrition bars and I know that what I’m putting in is good for me. With the new year in full swing, get back on track with Earnest Eats -- The Messie Kitchen APPROVED.